Blueberries are a beautiful and healthy fruit with a very unique flavor. There is really nothing like blueberry pie. That unmistakable deep blue-purple juiciness combined with a tender flaky crust is hard to beat. But if you fear pie-making or you’re in a hurry and want a pastry that still hums with a bright blueberry buzz, try this Blueberry Buckle. Betty: A baked pudding made of layers of fruit and buttered breadcrumbs. 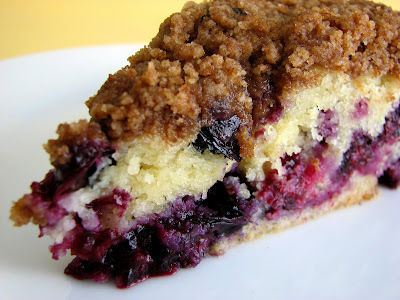 Buckle: A simple, single-layer cake made with berries with a streusel topping. Cobbler: A fruit dessert topped with a thick biscuit crust. Crisp/crumble: Fruit topped with a crispy/crumbly mixture. Grunt/slump: An old-fashioned dessert of fruit topped with biscuit dough and stewed. Pandowdy: A deep-dish dessert made of apples, butter, spices, brown sugar or molasses, topped with a biscuit batter that becomes crisp and crumbly after baking. OK, back to our Blueberry Buckle. This is a very moist, very fruity cake. It’s an extravagant way to enjoy the incredible blueberries we have at the moment. Some eat it for breakfast, others for dessert. As you wish. - I love this cake because it’s bursting with blueberries and it's not very sweet, so the fruit really shines. I’ve made it without the streusel and that works for me. The streusel does add more sweetness and a nice crumb texture as well as a hint of spice and it, too, is very delicious in its own way. Depends on personal taste and your mood. 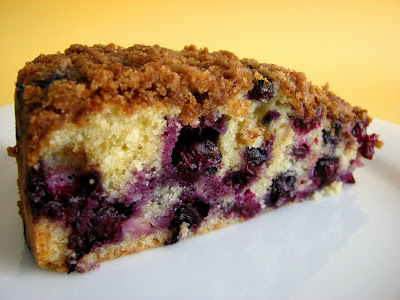 - This is a very, very thick batter, which allows the blueberries to remain suspended and evenly distributed throughout the cake. Don’t be tempted to thin out the batter. Just gently fold in the blueberries. 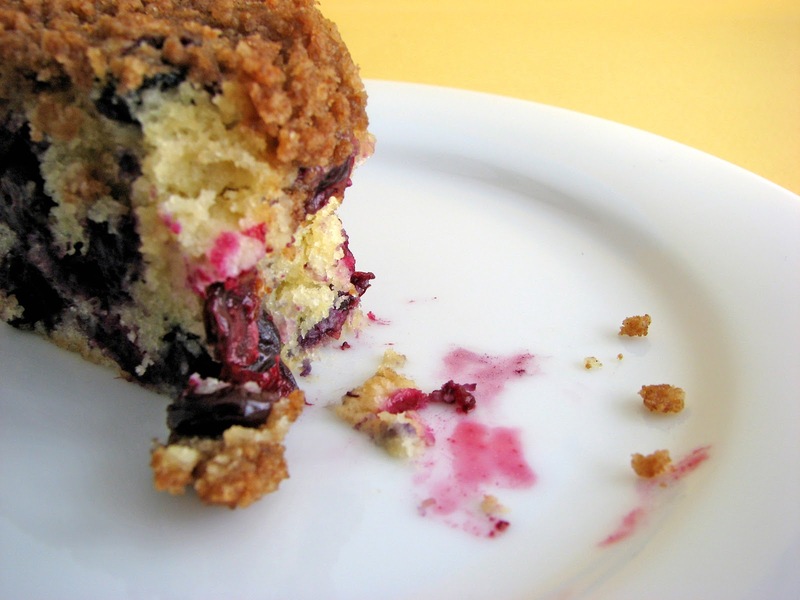 - Use firm blueberries that are not overripe so they maintain their shape and don’t discolor the batter as you fold them. - Check the cake around 40 minutes. My oven runs hot and the cake was done in 45 minutes. For streusel, mix together flour, sugars, cinnamon and salt. Add butter and mix on low on low speed until you have a moist mixture with some small pieces of butter still in tact. Transfer to a bowl and set aside. Preheat oven to 350 degrees. Prepare a 9” cake pan with 2” sides with parchment paper, butter, and a dusting of flour. For cake, whisk flour and baking powder together and set aside. Cream butter, sugar, salt, and lemon zest until light and fluffy, about 3 minutes. Scrape down the bowl. Add vanilla and mix about 30 seconds. Add eggs one at a time until fully incorporated. The mixture will appear broken. It will come together soon. Add flour and mix until almost completely incorporated, about 20 seconds. Remove bowl and finish mixing with a rubber spatula, scraping bottom and sides of bowl, until no flour pockets remain. The batter will be very heavy and thick. Distribute streusel evenly over batter. Bake until deep golden brown and a toothpick inserted into center of cake comes out clean, about 45-55 minutes. Cool 15 to 20 minutes. Turn out the cake. Cool completely. Serve! Thank you for the comprehensive list! I'm going to print it and post it over my baking table! oh, i have been thinking of making a peach buckle for awhile. this recipe looks DELICIOUS! This looks great! I'm coming over to your house for dessert! I love blueberries. Your Blueberry Buckle looks tasty. Think I'll try it next week. Thanks for sharing. i never really knew what a buckle was! thanks for the glossary... i love anything with blueberries. a simple blueberry muffins will make my day so I can imagine how wonderful this buckle must be! Buckles are new to me, but I adore anything with blueberries in it. Yum! Thanks to everyone for stopping by. Blueberries truly are so wonderful. 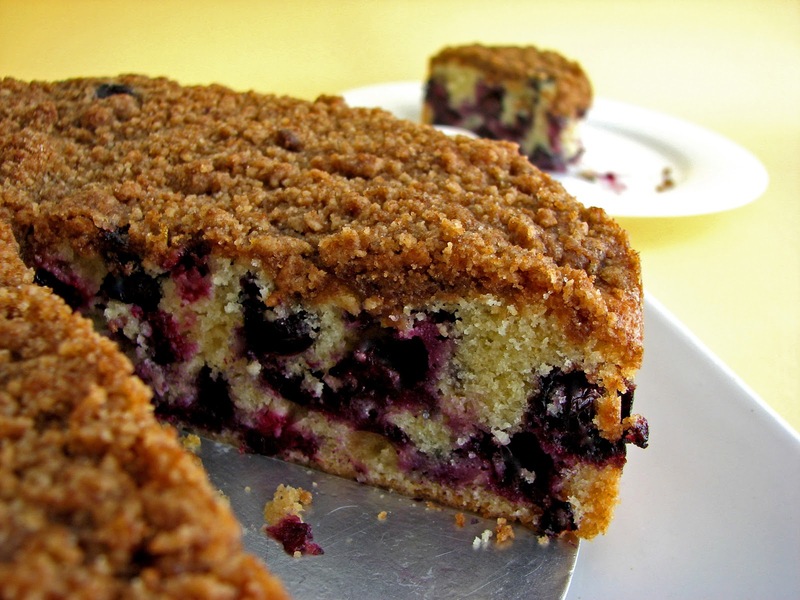 This cake gives equal time to blueberry bliss! Looks so tempting. I'm craving for a slice right now! Just randomly came upon your blog while looking for a Buckle recipe. Thanks so much for this... it is delicious and perfect in every way. Blueberry season and I made this last night. I loved it. I liked the contrast of the sweet, crunchy top with the less sweet cake. Finally a recipe with a decent amount of blueberries. Thanks., I wish you would add weights to these older recipes. Hi and thanks for your suggestion. I've actually tried several times to go back into these older posts and amend them but there is something very glitchy going on with this platform. When I try to revise them, the whole page goes wonky and it won't format at all. It looks terrible with all kinds of crazy spacing. It's incredibly frustrating and I'm sorry for the inconvenience. I'm glad you enjoyed the cake. It's a super blueberry buzz and definitely one that I highly recommend. Hello! I just made this with 4 cups of frozen blueberries. It is delicious, but a little runny right in the center as if it had too many blueberries. Can you help? Hello, Madeleine! I don't usually bake with frozen fruit but my guess is (assuming you used a 9" round pan) because frozen fruit holds more water and the recipe is loaded with them, the cake will take a bit longer to bake. Make sure the berries are pretty evenly distributed and then just keep checking every couple of minutes until a tester inserted into the center comes out with no visible cake batter. I hope this helps!